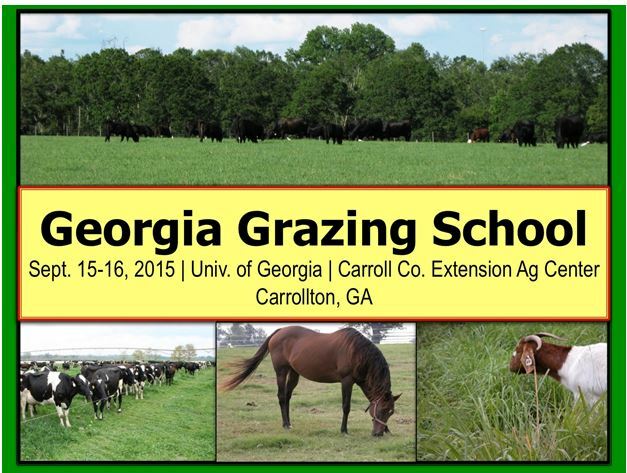 CARROLLTON, GA – UGA Extension will host the Georgia Grazing School on September 15 – 16, 2015 at the Carroll Co. Agri-Center in Carrollton, GA. This two-day workshop will focus on soil fertility, forage crop establishment, plant growth, animal nutrient requirements, and management-intensive grazing. Training will take place in both classroom and field settings. Multiple classroom lectures addressing plant and grazing management will be combined with a visit to Jerry and Angie Stober’s farm on the morning of Wednesday, September 16. At the Stober’s farm, participants will get additional exposure to hands-on activities, including demonstrations of new watering systems, fencing systems, sprayer calibration techniques, GPS-based guidance systems, baleage production, no-till drill calibration, and much more! Participants will also get a chance to hear from other producers who have successfully utilized better grazing management on their own farms, including the Stobers and Tuesday evening’s guest speaker, Mr. Terry Chandler from Stillwater Farms in Danielsville, GA.
Additionally, the program features Ms. Kathy Voth as a special guest speaker this year. Ms. Voth is widely known for her research at Utah State University where she was successfully able to train livestock to selectively graze many of the major weed species in a pasture. Her efforts developed into a training program for grazing livestock that enlists the animals in the battle to keep weeds under control. The results have been truly been remarkable. Cost of the two-day program is $150 for the first person from each farm and $75/person for each additional person from each farm or family. This registration fee includes lunches and breaks on each day, dinner on the first night, and a grazing school handbook. Registration is limited to 75 participants and accepted on a first-come, first-served basis. So, interested persons should register soon. For more information on the Grazing School program give us a call at the office.